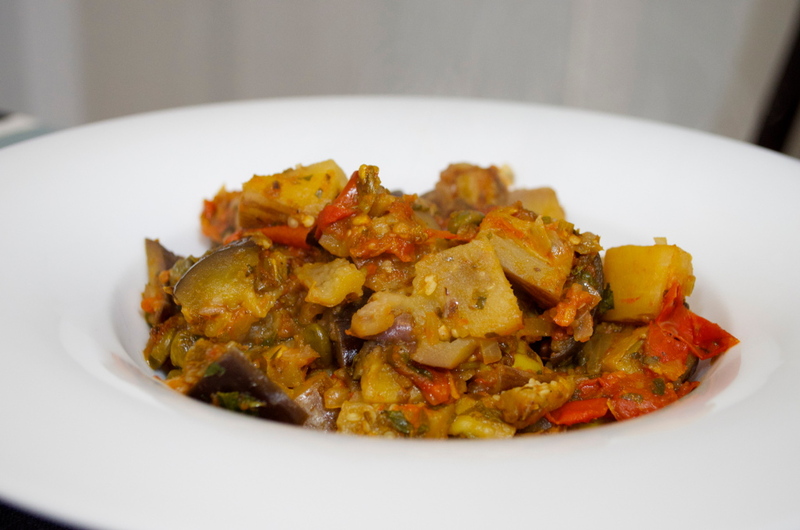 This is a vegetarian recipe typical from Italy, it’s a nice choice to eat just the caponata or to serve aside with some meat or fish; it is also great if you bring it to work in a tupper, for example with some pasta or cous-cous. First lets cut the ingredients. Cut the eggplants in medium pieces, like splitting the eggplant in two longitudinally, and then each part cut in 4 longitudinally, and finally cut in pieces of about one finger and half width. Chop one onion. Divide the stalks and leaves of a bunch of parsley and chop them. Remove the peduncles of 5 tomatoes and cut the tomatoes not so small pieces. Once we have the ingredients cut, let’s start cooking. Put a bit of olive oil in a pot. Add the eggplant, some salt, some ground pepper and two tablespoons of oregano (I’ve forgot this step while recording the video so I will add later), in order to avoid adding too much olive oil, stir frequently and add just a bit if needed. After five minutes add the onion, the chopped parsley stalks and 3-4 crushed garlic cloves. Stir and cook for 2 minutes and add just a bit of olive oil. Add 12 olives (or more if you like them), 2 tablespoon of capers and a bit of herbal vinegar. Cook until the vinegar evaporates and then add the tomatoes and some salt. As I’ve forgot to add oregano at the beginning I add it now mix well everything, cover the pot with a lid and cook for about 15-20 minutes. After this time, turn off the heat, add the chopped leaves of parsley, cover the pot again with the lid and let rest for about 10 minutes before serving.